Every year on 24 September we celebrate Heritage Day in South Africa. The braai has become synonymous with South Africa and its heritage and so Braai Day or Braai4Heritage was born in 2005, and is celebrated together with Heritage Day. But make no mistake – South Africans definitely do not reserve their braaiing activities only for Braai Day. With thousands of South Africans standing ready with a braai grid in hand every weekend, it’s only fitting to share some of our favourite braai recipes with you. These glamping-friendly recipes are suggested by AfriCamps team members from across the country and each recipe brings something special to the table, whether you enjoy them at AfriCamps or at home. From baking breads to grilling desserts – take a look, and indulge! Share your creations with us by tagging #WeAreGlamping in your pics! Ryan and Michelle McKain from AfriCamps at Mackers in Hazyview suggest baking a Potbrood (Afrikaans for pot bread) while braaiing your meat. Potbrood works especially well with the round braai pits at AfriCamps at Mackers. Just remember to pack a pot! Roll the dough into balls and place them in a cast iron pot. Mix the 2 packets of cheese sauce with the cream. Pour the mixture over the dough and sprinkle the grated cheese on top. Place the pot on a stand in your braai. Place a couple of coals under the pot and a couple on top. Bake for around 40 minutes whilst braaiing your meat. You can add herbs, garlic or bacon for extra flavour. AfriCamps at kam’Bati’s Jaco and Dene Badenhorst’s favourite by far is braaiing rump steak. Jaco suggests the well-matured and always tender rump steaks from the butchery at Swellendam’s Spar supermarket. Make sure your coals are very hot and place your steaks on the grid. Each braaibroodjie needs two slices of bread. Spread butter and chutney on one slice. Place sliced onions, sliced tomatoes and grated cheese on top and close your sandwich. After you have removed your steaks from the braai, place your braaibroodjies on the grid on low heat. Turn the grid often until the bread is golden brown and the cheese has melted. Enjoy with a feta and avo green salad. Fellow South Africans might be familiar with the legendary Braai Pie, first introduced to foodies by SuzelleDIY. Since 2014, many variations of the Braai Pie have been created – including this one suggested by AfriCamps at Oakhurst. Camp owners Jake and Claire Crowther are treated to this delicacy when their eldest daughter, Landon, comes home from boarding school over the holidays. The braai pie is a sure crowd pleaser and makes an excellent snack to enjoy around the fire, or as a side dish with your meat. Lay out your first layer of pastry. Chop your fillings and spread them onto the puff pastry. Place the second layer of puff pastry on top of the fillings (like a sandwich). Press down the sides with a fork to seal the pastry. Beat the egg and paint it onto each side of the pastry. Place on a braai grid and grill over coals for about 15 minutes. Cut into squares and share! Another Crowther favourite is a rump steak appetizer enjoyed around the fire – guaranteed to get your guests in the mood. Whilst friends and family are socialising and enjoying snacks around the fire, put a thick rump steak, that would normally have been served for dinner, straight on the grid, on the hottest coals you can produce. Very hot, very close to the coals, very fast – scorched black on the outside, and as rare as you dare on the inside. On a wooden board, cut the entire steak into thin 1 cm strips right there at the fireside, straight from the grid. Grind a generous amount of coarse salt on the rare strips and serve to your guests, eaten with fingers straight off the board. This taster never fails and is the best way to enjoy good rump steak. Being a wine farm, most of AfriCamps at Stanford Hills’ favourite dishes contain at least a dash of red or white wine! For Braai Day, camp owners Jami and Peter Kastner suggest a braaied ribeye steak served with rocket, roasted pepper, lemon and baby potato salad with Jackson’s Pinotage red wine sauce. Season 250g ribeye steak with sea salt flakes and cracked black pepper, bring to room temperature. Season the red pepper and toss it in olive oil. Roast the red pepper on the braai until soft and slightly charred. Roast the Baby Potatoes with the lemon zest, lemon juice, olive oil, seasoning and cayenne pepper until cooked through. Place your meat on the braai, turning over only twice until medium rare. Let the meat rest while you toss the potatoes, peppers and rocket together. Plate the steak with the salad and drink the wine, (no need for sauce). Or, if you prefer to use the Jackson’s Pinotage for a sauce, reduce 1 Bottle Jackson’s Pinotage with 5 liters of beef stock and a sprig of rosemary until reduced. Enjoy over a view of the dam at Stanford Hills! According to Stephan and Lindi Busch from AfriCamps at Pat Busch, “you really can’t beat a simple lamb chop on the braai”. Good quality lamb loin chops, Karoo lamb if possible, not too much fat, not too little either, not cut too thin, maybe as thick as your thumb. First, light your fire. Pour a glass of wine, or open a beer, relax & enjoy… Watch the fire, marvel over our mountain views (and take an Instagram pic). In the braaibak, toss the chops and mix it up a bit to get the vinegar, olive oil, coriander, garlic and rosemary to cover them. Let the chops marinate for about 10-15 minutes, and you can give them one more toss at half time. Don’t add salt at this stage, but you can add pepper if you like. When the coals are ready, arrange the chops on the braai grid with a sprig of rosemary here and there touching the chops, but so that the sprigs don’t fall out of the grid. Now braai them over a moderate heat as you prefer, but first grind some salt & pepper to taste on each side of the grid as you are braaiing the meat. You can now either braai the chops juicy & tender (medium) over a moderate heat, or you can cook them until the fat renders out and the chops are crispier. Stephan prefers cooking the chops over a moderate heat until they are done, and then lowering the grid and increasing the heat to crisp them up at the end. 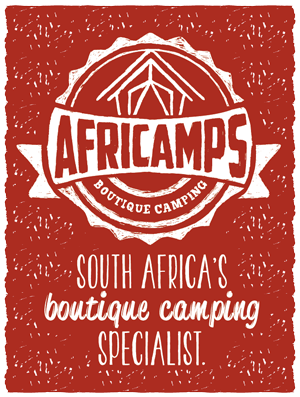 Esti-Mari, your gracious host at AfriCamps Klein Karoo has a personal favourite that every glamper can try when booking a braai pack from AfriCamps Klein Karoo. 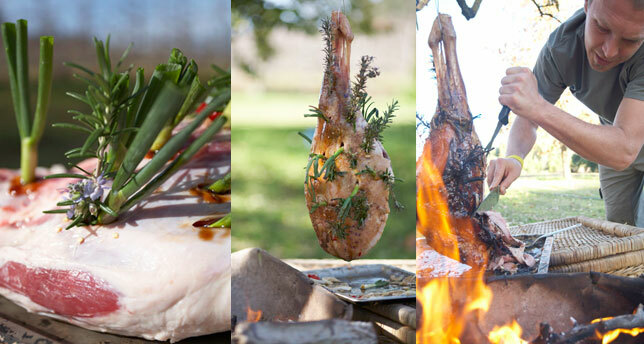 Your pre-booked braai pack comes with roosterkoek. Roosterkoek is a proudly South African bread prepared on the braai. This is a MUST. AfriCamps Klein Karoo mixes butter, garlic and herbs and then spreads it onto the Roosterkoek. It is then wrapped in foil and placed next to the coals when braaing. If you want to create your own feast on the fire, try these two recipes as suggested by AfriCamps Klein Karoo. Rub salt onto the meat. Fry the bacon, onion, green pepper and tomato over low heat for 10 minutes then remove from heat. Add in the spinach and mix well together. Add the rest of the filling ingredients and mix together. Place one slice of fillet on a flat surface, place the filling onto the slice of fillet and place the other slice on top of the filling. Wrap with bacon. Secure with string. Braai over medium coals until done. Cut into slices and serve. Cut the onion into large but thin rounds – keep the rounds whole and pack them onto the buttered side. Add the thinly sliced tomato rounds – sprinkle with salt and pepper. Place the tomatoes in the centre of the sandwich filling (not directly on the bread – this prevents the broodjie from becoming soggy. Grate strong cheddar and generously sprinkle over the tomato and cover with the other slice of bread. Make sure you cover all of the tomato slices with cheese. After everyone has braaied and the coals are low – pop them onto a braai grid and allow to toast until they are browned on both sides! Depending on how hot your fire or coals are you will need to watch these carefully as they can toast quickly. Co-founder of AfriCamps, Manou Bleumink suggests a (somewhat) healthy dessert option – banana boats with chocolate. An alternative to braaiing marshmallows, try this banana, marshmallow and chocolate treat! Cut a slit in the concave side of the bananas and open up a pocket. Fill the pocket with chocolate chips and top with marshmallows. Place the bananas on the braai grid, marshmallow side up and let it cook for about six minutes or until the marshmallows start to brown. Serve warm and enjoy! The grand finale. AfriCamps co-founder, Jeroen van Rootselaar takes on the brave task of the Tarzan Roast. Warning: The Tarzan Roast, as introduced by Justin Bonello, is for the more experienced braaiers out there. This is an excellent Christmas dish, with rosemary sprigs sticking out of the leg of lamb, resembling a Christmas tree. Lay the leg of lamb on its side in the baking tray and, using a small sharp knife, cut slits 3-5 cm deep at a 45-degree angle all over the lamb. Push rosemary sprigs, chilli and garlic slivers into the slits, then dip the spring onions in the oyster sauce and push them in as well. The green leaves will jut out, a bit like a porcupine! Mix together the oregano, the balance of the oyster sauce, the onions and the juice from the lemons and orange, and pour this all over the leg of lamb. Leave to marinate while you make the fire. The meat cooks by radiated heat and is gently smoked at the same time. Use orange or apple wood because of their aromatic properties. The original recipe uses a wheelbarrow to make the fire in because the cooking time is somewhere between 4 and 6 hours, and during that time Mother Nature could blow hot and cold and change her tune a number of times. With a wheelbarrow you can adjust the position of the fire and take full advantage of the prevailing wind. First, slip the wire through the shank and twist it so there’s no chance of the meat falling into the fire. Attach the wire to the rope with a slipknot. Once the leg is attached to the wire and the rope, you need to find a nice strong branch in a tall tree from which to hang your meat. Again using a slipknot attach the rope to the branch and then, between the wire and the tree, make a sheepshank knot in the rope – this way, you can adjust the height of the lamb as required. Balance the baking tray with the left over marinade on a stool and position this directly under the joint. Wheel the fire in next to the stool and place it so that the prevailing wind is blowing towards the lamb. You should be able to hold your hand between the fire and meat for just a few seconds without burning it. If it’s not hot enough add a couple of extra logs on the fire to really get the heat going. You can use the forked stick to push the leg closer or further from the heat. And that’s it. For the next 4 to 6 hours, you need to keep basting the lamb with marinade and the fatty juices that drip into the tray. Every 10 to 15 minutes turn the meat about 45 degrees and secure its position with the forked stick. Keep testing the heat and add a log when necessary. Otherwise, your early evening meal could turn into a midnight feast. After 4 hours or so, poke a skewer into the thickest section of the joint to see if it’s cooked. If the juices ooze out red, it’s still raw and needs more cooking; pink juices mean the meat is perfectly medium rare. When it is cooked, raise the leg or remove the heat and let it rest for ten minutes. Carve the meat while it is still hanging up – that way, if it’s a bit too rare closer to the bone, you can just drop the roast back near the heat and cook it for a bit longer. Slice open the pita bread to make a pocket. Stuff with shredded lettuce, roughly chopped tomato, fresh basil, medium rare lamb and a good dollop of Greek yoghurt. For gravy, make a sauce by pouring all the drippings and scraps of lamb in the baking tray into a pan, mix a teaspoon of cornflour in a cup of milk and add this to the pan. Keep stirring on low heat for between 5 to 10 minutes until the sauce begins to thicken. Enjoy your well-earned feast! Whatever you choose to throw on the grill, we hope you enjoy Braai Day with your loved ones. And remember, these recipes are great throughout the year!